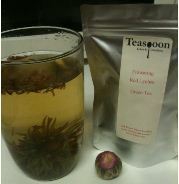 Flowering Red Lychee Green Tea – Interesting looking green tea, this has no flavour whatsoever. It does have a slight scent but the flavour is pretty much nonexistent. In fact, I didn’t even bother finishing the mug I’d made because it was much like drinking hot water with a slightly weird aftertaste. Don’t bother buying this tea. It is awful and a waste of money. A nice forthright review! I’ve moved onto drinking green tes recently, nothing particulary classy though, just the cheap tea bags, probably should look to going the whole hog to loose leaves and tea strainers.